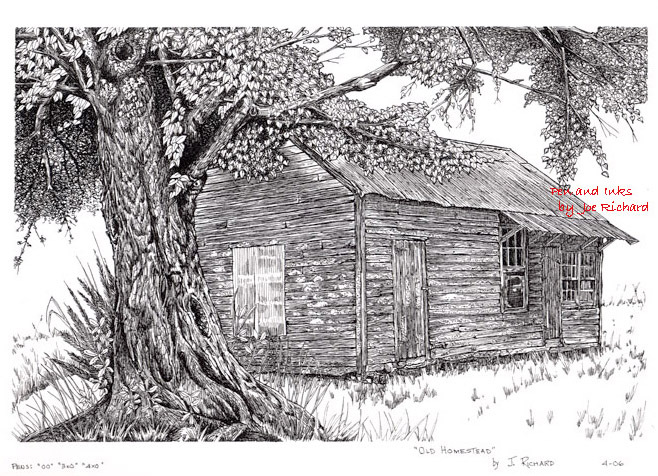 "Old Homestead" is a study in pen and ink depicting the remains of my wife's side of the family's homestead in southwestern Louisiana. The original building constructed in the mid 1800's had long since been torn down to be replaced by the current structure depicted in this study. Much of the lumber depicted in this drawing is "old cypress" which had been milled by hand as the family first set up their home after arriving in these parts of southwest Louisiana. In the early 1900's, the original homestead was taken down and the lumber reused to build the current structure. Some years later the structure was again partially razed (the part to the right of the drawing) to begin construction on a newer structure in the early 1950's. All that remains is what is depicted in the drawing above. The gnarled tree depicted in the sketch has been there for at least 100 years. The drawing utilizes mostly pen and ink line work with the use of heavy shadows where detail was needed. 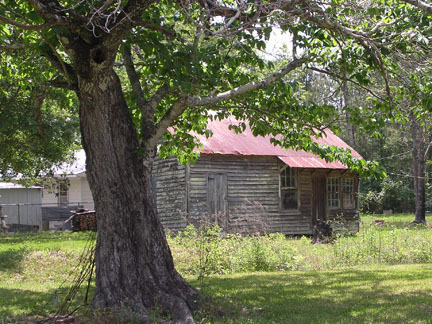 One of the photos used in completion of the "Old Homestead" artwork. The photo was taken by the artist and is Copyrighted by him.